You might think it’s kind of silly to have a post about how to put bacon on a sandwich, but until very recently, I was doing it wrong. Did you know there is a right and a wrong way to put bacon on a sandwich? Yeah, I didn’t either. But there is. 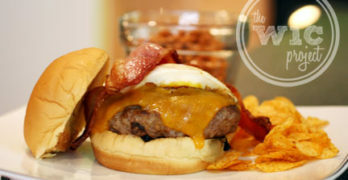 If you’ve ever eaten a sandwich with bacon, only to wish that you could have bacon with every bite, then you need to read this post. If you’ve ever taken your sandwich apart so you can shove back in pieces of bacon that have fallen out, then you need to read this post. 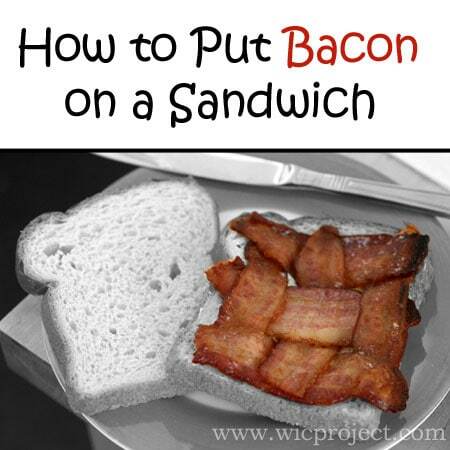 I’m not sure where I first saw this, but since learning of it, I’ve become a huge fan of this method of putting bacon on sandwiches. Hint: I’ve found that 3 strips of bacon is optimal for sandwiches. You end up with a 3×3 bacon grid for square sandwiches, or can do a 2×4 for long sandwiches. Cut bacon in half. With 3 pieces of bacon, you should end up with 6 pieces. 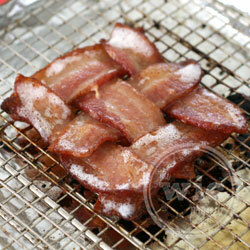 Next we’re going to make a bacon grid (or some would say, a bacon lattice.) 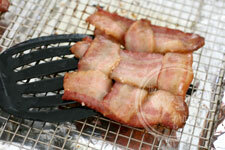 Place three pieces of bacon across on a cookie sheet or wire rack, then weave in the remaining three pieces. The first piece would go over the left bacon, under the middle, and over the right. The second piece would be under the left bacon, over the middle, and under the right. 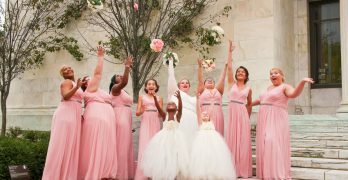 The third piece would be over the left, under the middle, and over the right. Place sheet with bacon in a cold oven and heat to 400F for 17 to 20 minutes. Cooking time will vary based on how thick your bacon is. Monitor frequently after the 15 minute mark or so. Flip carefully. If it falls apart, grab a fork and put the grid back together. I like to check my bacon about halfway through and flip it over using a fork or a spatula. This prevents the bacon from curling too much. I also like cooking my bacon on wire racks in a cookie sheet. This lets the fat drip off the bacon as it’s cooks. It also makes me feel like I’m being healthier…while eating a bacon sandwich. Wire racks for cooking “healthier” bacon, LOL. 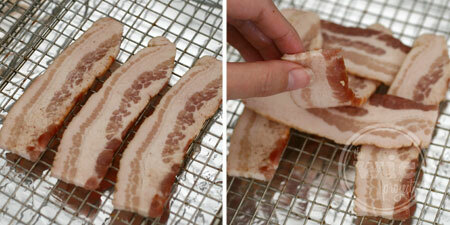 Once bacon reaches desired crispiness, remove from the oven and let it drain on a paper towel. Throw it between some bread, swipe on some mayo, add a leaf of lettuce (and tomatoes if you like them, which I don’t, but you might) and enjoy! With this bacon grid on your sandwich, you’ll get a bit of bacon with every bite. Brilliant! How do you put bacon on your sandwich? This is great…OF course, I can very rarely get away with BAKING bacon for my boyfriend..but maybe this idea will appeal to him! This is way too cool. 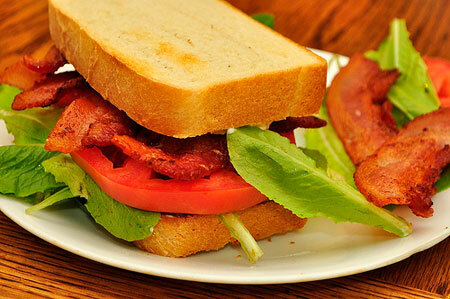 I don’t eat much bacon but will definitely try this when we do BLT in the summer. My problem is that I rarely can wait to actually make a sandwich to eat the bacon. So I would have to make 2 of these, one for the sandwich and one for me to eat while making the sandwich. 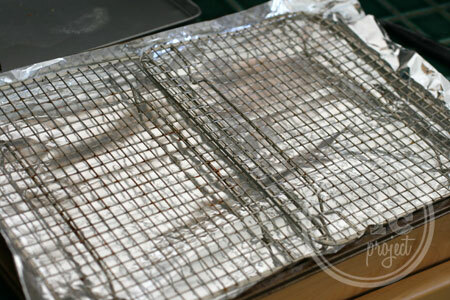 I have just started making my bacon in the oven. I’ll be sure to use this method next time we have sandwiches! I never thought about cooking it that way! I’m going to change how I make it from now on! Thanks for the post. Great idea. I’ll have to tell my father. He enjoys a good BLT. It’s been a long time since I’ve eaten bacon on a sandwich; but I don’t remember having enough issues with the bacon falling out or not being evenly distributed to warrant a solution. Your grid reminds me of the pot holders we used to make as kids. I like to just solve the problem by putting bacon on everything…it makes the world a better place. That makes it easier, i look forward to trying it. I hate eating a BLT and not getting a taste of everything with every bite. This sounds like a great solution. That’s a great method. I bet it could work with grilled vegetables or cheese too. I’ll have to remember it the next time I make a sandwich so I don’t have to deal with half of the middle falling down into my plate. Okay, I’m officially hungry now! 🙂 YUM!!!! this is a way neat idea! Gonna do this from now on!! Bacon!!! I must say that until now, I have never given any thought as to how bacon should be placed on a sandwich! This is also the first time I’ve ever heard anyone talk about it, lol. I just make sure the entire sandwich is covered with bacon! Haha, that’s my kind of sandwich. 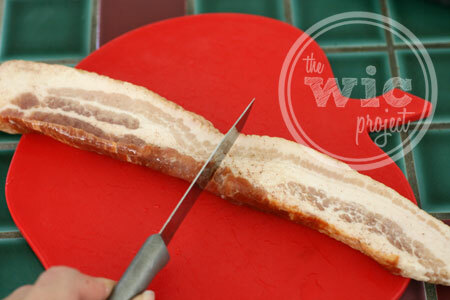 Right now I just cut the pieces in half and lay them on there but I want to try this for complete bacon coverage.